Best reason to read it: Thirty pages into Thinking, Fast and Slow and you’ll start to question a lot of the decisions you’ve made. Kahneman looks at fast, intuitive, emotional decisions vs. slower, theoretically logical decisions and shows how the two combine (and compete) to help us make judgments—many of them wrong. You’ll learn about risk, predictions, overconfidence, and how to make better decisions. It sounds like heavy going but Kahneman makes it fun, especially if you enjoy laughing at yourself. Fun takeaway: Framing matters; German judges tended to give a shoplifter a longer sentence if they had just rolled a high number with a pair of dice. Think about that the next time you start to negotiate. Best reason to read it: Granted it’s a little on the fan-boy side, but In the Plex is probably the best account of the birth and growth of Google. You’ll get a look at the decisions, both technical and business, that made the company what it is. It’s a true inside look at the company and its major (and relatively minor) players, and a non-geeky description of how the various technologies work. Feel free to skim: Don’t fret if the technical details, especially early on, are hard to follow. Understanding how technologies work isn’t as important as knowing how their use impacts the business. Best reason to read it: If you like sports, this is your book. If you like behind the scenes access to personalities you’ve watched and listened to for years, this is your book. If you like learning about key decisions that turn a struggling company into a global phenomenon, this is definitely your book. If you don’t like sports and hate ESPN, stay away—otherwise it’s a great read and an instructive tale of how a number of smart, driven people built a business… and how a few might have let a business get away. Spoiler alert: It’s safe to say Mike Tirico wasn’t a fan of Tony Kornheiser after all. Best reason to read it: Starting a business is both art and science, and The Lean Startup provides a framework for the science of founding a company. “Lean” doesn’t only refer to bootstrapping, though; it also refers to developing a minimum viable product and then deciding, based on data, when to stay the course or shift directions. Key Takeaway: As odd as the thought may sound, creativity and innovation can be efficient processes. Best reason to read it: Many entrepreneurs create a company based on a technology, or a service, or a value proposition… and many have absolutely no leadership or management background. Managing Right for the First Time lays out a simple, logical, and intuitive blueprint that helps new leaders avoid the mistakes the rest of wish we hadn’t made. Tip: Buy five or 10 and hand them out the same time you hand out promotions. Best reason to read it: Some companies go through expensive formal transformation initiatives. No matter how comprehensive or “groundbreaking” the process, they won’t work when, as Practically Radical explains, leaders haven’t first challenged and transformed themselves. Taylor shares plenty of behind-the-scenes stories that make the book an easy—in a good way—read. Key takeaway: If you want your company to stand for something, first you have to stand for something—and look for ideas and innovations where others don’t. Sounds simple but it’s not, and Taylor describes how to turn your big ideas into actions. Best reason to read it: While the financial crisis is hardly breaking news anymore, the effects will reverberate for years. Boomerang provides an international perspective that will at the very least make you sound a lot more intelligent at parties. Tip: Anything by Michael Lewis is a great read—he’s the king of making complex subjects light and entertaining reads. Start with Liar’s Poker and work your way forward. Best reason to read it: Every successful entrepreneur has his or her “what’s it all for?” moments. Beyond Wealth will make you think about a broader, personal approach to success and living a “good life.” (You, of course, get to define what a “good life” is.) If you like to think about your place in the world—and in the world of your family, friends, and community—you’ll enjoy this book. If you like to have your assumptions challenged, you’ll love it. Key takeaway: The only definition of “true wealth” is the one you choose—and live by. Best reason to read it: If you’re of a certain generation you’ll love I Want My MTV if for nothing more than all the stories behind the music videos. If you’re not, you’ll love the insiders’ account of how a few people with an idea built a company and sparked massive cultural change. Either way you’ll wish that you too could create a business where other people created and provided your product at no cost to you. Unfortunate outcome: You’ll feel really bad for Billy Squier. Best reason to read it: I have a heavy process improvement background, which means I typically run screaming from process improvement books. Little Bets is different, because it transforms those formal, rigorous, boring processes into something a lot more fun: experimenting, taking chances, just giving lots of stuff a try. Sims argues that if you’re not doing the bulk of your learning by doing, you’re probably not learning much. Fun fact: The writers for The Onion dream up about 600 possibilities for every 18 headlines they run; that’s experimenting. Best reason to read it: It’s one of the best underdog stories you’ll encounter. Unlike most founding fathers, Washington didn’t attend college and was always self-conscious about his “defective education.” He got over it, becoming one of the wealthiest Americans of his time, a great general (he lost a lot of battles, but still: You try holding an under-paid, under-fed army together for eight years), allowed public service to cripple him financially, and walked away when he could have become a quasi-king. Oh, and he also helped build an economy and a country. Tip: Chernow’s other books are also wonderful, especially Titan: The Life of John D. Rockefeller. Read it and then build your own empire. Our CEO Kalika Yap was quoted in Wall Street Journal Today! “Gerber’s book caused me to rethink what I wanted to accomplish in my business and how I was going to do that,” explains J. Richard Braun, owner of Braun Agency Inc., an insurance firm based in Virginia Beach, Va.
“The E-Myth,” he explains, argues that most businesses are started by people who know how to do technical work—such as a plumber who launches a plumbing company—but who don’t know how to run a business. The answer? Build “replicable systems that can and will operate in an owner’s absence,” Mr. Braun says. By putting those systems in place, owners can hire other technicians to do the company’s core job and then get managers to oversee the business’s various operations. Then the owner can concentrate on the true work of an entrepreneur—providing a vision and overall goals for the company, as well as looking for new opportunities. “Who” is the book “that has had the most influence on my business,” says Craig Zoberis, president of Fusion Systems Inc., a contract manufacturer based in Burr Ridge, Ill.
“Sinek’s message changed my life. He had me understand why it’s important to know why you’re in a particular business, both for your own fulfillment and for attracting the right customers and employees and ultimately achieving great success,” says David Hassell, CEO of San Francisco software start-up 15Five. This book tackles an old topic—starting a business—but is much more clear, focused and entertaining than a lot of other manuals on the market, says Steven Kaplan, faculty director for the Polsky Center for Entrepreneurship at the University of Chicago’s Booth School of Business. This book demolishes the usual excuses entrepreneurs have for not starting a business, says Saras D. Sarasvathy, an associate professor at the University of Virginia’s Darden School of Business. “Little Bets,” she says, argues that you don’t need one of those big ideas; you can start with something simple. The book “shows how ‘doing the doable’ without waiting for a big idea, or guarantees about the final outcome, can lead to amazing breakthroughs,” she says. This guide to developing structured, disciplined routines was “an important influence in my journey from lawn boy to serial entrepreneur,” says Barrett Ersek, CEO of Holganix, a Glen Mills, Pa., start-up for fertilizer supplements. Using old magazines for wrapping paper. Using and reusing decorations for parties. Using glasses for drinking water, as opposed to bottles. Using scrap paper in our printer. 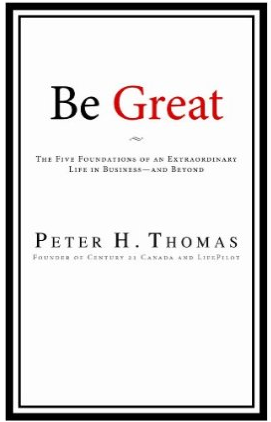 I’m currently reading Peter H. Thomas’ inspiring new book: Be Great – The Five Foundations of an Extraordinary Life in Business – and Beyond. I received the book during the Entrepreneurs Organization Global Leadership Conference. Thank you for the book! Peter was the founder of Century 21 Canada.